GRITIT gritting operations run the length and breadth of the country; we cover Land's End to John O'Groats. GRITIT has five regional depots: Scotland, North England, Midlands, London & Southeast England and Southwest England. 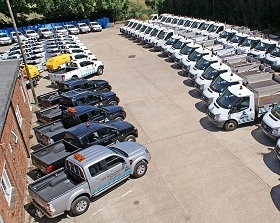 Each of these hold the GRITIT gritting and snow clearance fleet for the area which can number 100s of snowploughs and 4x4s in the areas where our services are more highly sought after. Our regional depots coordinate all our operations and this is where the operations experts who come and visit you for your free site survey are based. During the winter, our depots are open 24/7, ready to come and grit at a moment's notice, or to grit according to your automated gritting plan that you have purchased. We never run out of salt because we have our own stockpile!